Doggacino anyone? The RSPCA dog cafe at the Million Paws Walk. 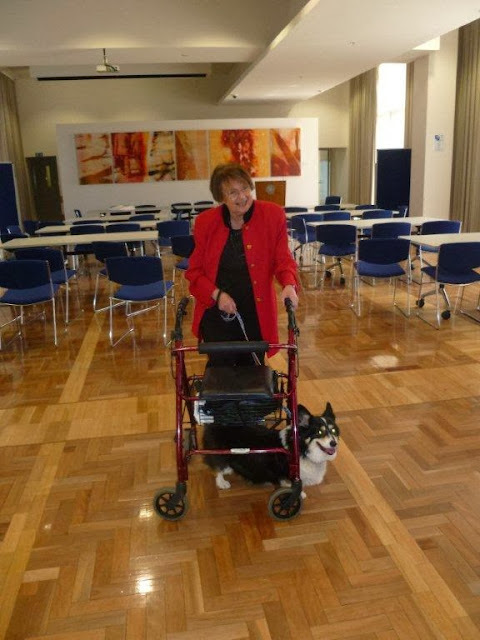 I met Jan Phillips at the Australian Companion Animal Council meeting earlier this year. She is a former Body Shop franchisee, current funeral celebrant and lifelong animal lover. RSPCA were my insurers for the volunteers and we walked dogs, groomed cats and took animals to vet appointments for the sick and elderly plus we fostered the animals if the client went into hospital or respite and found homes for the animals if the client could no longer look after their pet. This went on for 12 years until I retired from The Body Shop and I handed the PAWS over to RSPCA who called it Pet Support and it does still exist in a reduced form to this day. I am also the Rescue Officer for the Scottish Terrier Club of NSW. And I have rescued recently 6 Scotties from a puppy farm in QLD plus another from a family going overseas to live in QLD. One of Jan's PAWS clients with her Corgi Coco. Jan continues to lend a hand by walking Coco. You’re passionate about pets and aged care, why? My experience helped me advise them about the setting up of an in-home service for the elderly. However we are currently addressing the problem of retiring into aged care if you own a pet. This was a great sorrow for many of my PAWS clients having to surrender your pet on entering aged care so I was very happy to hear that something was going to change all that and we have!!!! For many of the retirement villages, although the high care end and hostel care will have to have the support of a branch of the in homecare when that is up and running. Funding is our main problem for all of this, and so far that area has been the hardest part to obtain. Why is the human-animal bond so important to you? Many of the sick and elderly I came across with PAWS told me every day “If it wasn’t for this dog/cat I would be dead”. We all know how important animals are in the lives of so many people yet it has taken government bodies and the medical profession decades to acknowledge this and even now there is reticence to address this life saving issue. Belle, a Scottish terrier rescued by Jan. She requires ongoing vet care and will need surgery to remove a number of masses on her chest and abdomen. When it comes to keeping companion animals, how could society do it better? I tell people whenever I am asked to speak on companion animals get out there with your dog and take it with you to places you would normally not go with them, because remember it is easier to get forgiveness than permission! In Europe animals are part of the family and can be seen on holidays with their people on boats trains and aeroplanes taxis and all public transport so why not here? At this stage I must say that all this can only happen if we start to train our animals to be out there and more visible. The owners must be responsible and of course not take dangerous or annoying animals to public places. It is possible though, and it needs us to bring about the change. As a celebrant you encourage people to bring dogs to funerals. 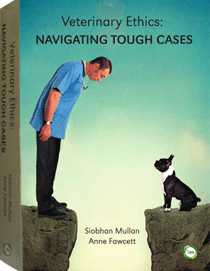 Do many people take up the suggestion and how do the dogs cope in these situations? As a funeral Celebrant, which I do part time, if I see there is a dog in the family that has just lost its owner during the family interview I suggest they bring the dog to the ceremony and we mention his/her name during the service. This adds to the interest, the pathos and shows how much that pet meant to the deceased person. Agatha, a dog rescued from a puppy farm, meets her new owner in Victoria, thanks to Jan's efforts. 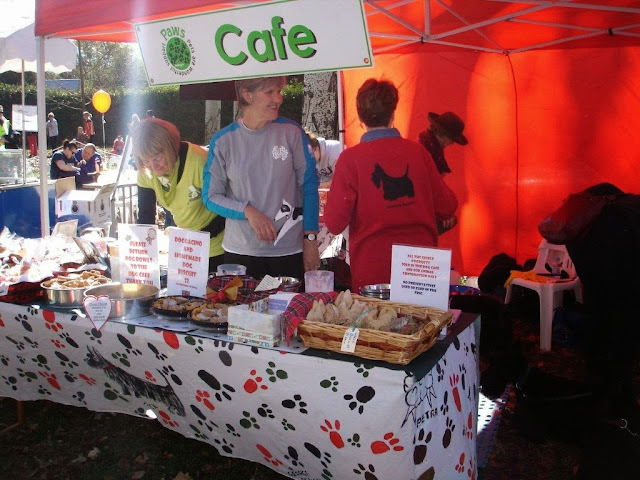 If you want to read more about pets and aged care please check out previous posts including this interview with Di Johnstone.